It’s the fourteenth century Balkans, and water transportation has recently been monopolized by a shady outfit called “Boats and Rafts” that imposes standard tolls for water crossings. Our fictitious monk-narrator acts as interpreter when two strangers appear in the realm and offer to build a bridge across the dangerous river that separates and possibly protects the land from the surrounding empires. Much to the dismay of Boats and Rafts, the proposal is accepted. As the construction progresses, suspicion surrounding the bridge grows even more quickly, and eventually unexplained events begin to occur. 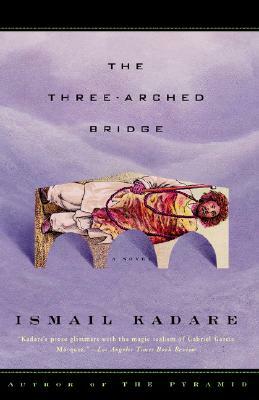 Against a deftly drawn historical backdrop and with carefully layered modern political commentary, Kadare’s narrative explores economics, mythology, community, and translation with wit and intelligence. This entry was posted in contemporary literature, fiction, novels and tagged albania, balkans, eastern europe. Bookmark the permalink.